Waved Albatross dancing. Photo by Aaron Logan. 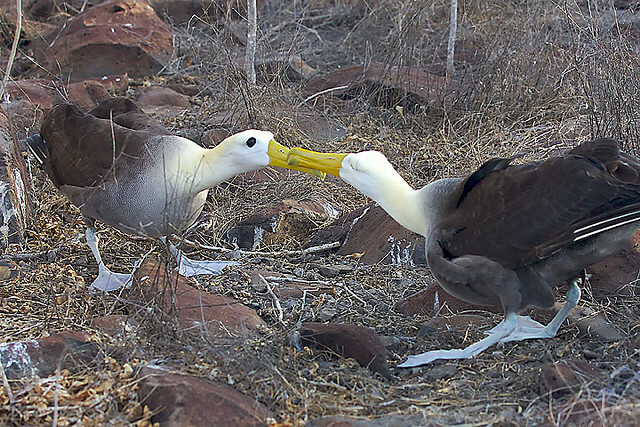 Albatrosses are large, long-lived birds, and they “mate for life” – as much as anyone does; which is to say, they more often stick with the same mate than don’t. They cooperate raising a single chick, which is a lot of work because that chick is large and slow-growing. Such close parental cooperation requires a strong pair bond. In order to establish the pair bond and to keep it strong, pairs perform the kind of dance that can only be done by performers with good coordination, flexible necks, and beaks that go clack. Here is a pair of Waved Albatross dancing. Make sure you have the sound on! It isn’t always pairs, either – here is a trio of Black-footed Albatross dancing. You can see, though, that the dance seems to have been choreographed for a pair: one of the trio keeps having to be subbed out. These may be nonbreeding birds practicing their dance moves; or they may be a breeding pair dancing with a third bird, which sometimes happens. 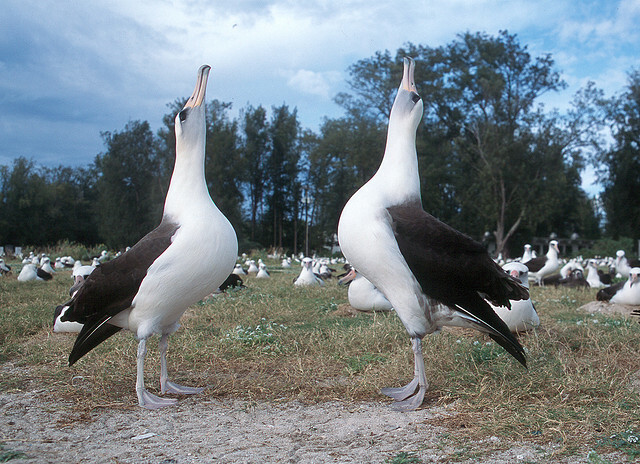 Dances are similar among albatross species, but not identical. Species differ in whether they touch bills before beginning to dance, in whether they extend one wing or two, in whether they perform moves simultaneously or alternately. Performing the dance well requires coordination and experience – much like rearing a chick, which, after all, is what they’re auditioning for. 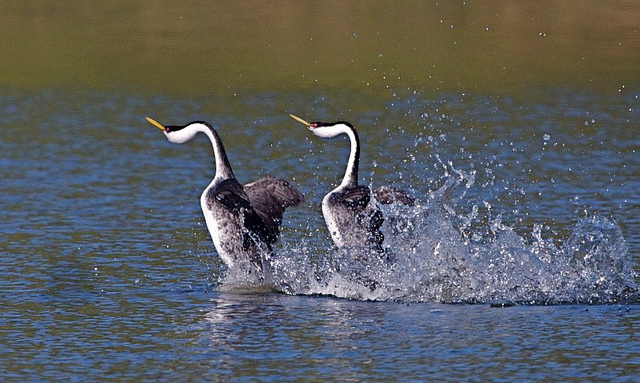 Western Grebes performing courtship dance. Photo by Teddy Llovet. 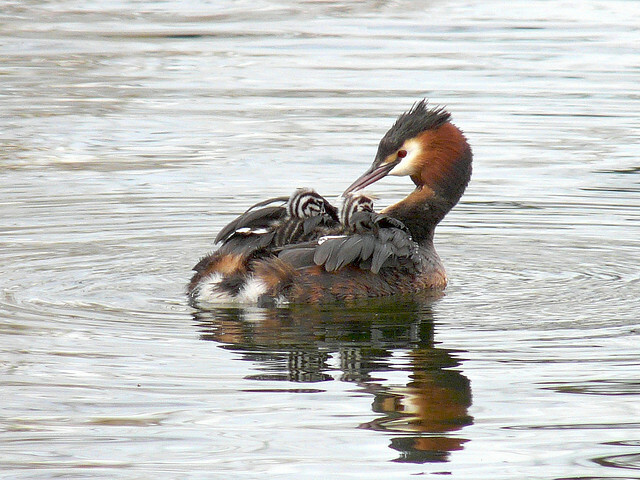 Like albatross, male and female grebes cooperate to raise their chicks. Instead of one large, slow-growing chick, they have multiple relatively fast-growing chicks – which must be carried around on the parents’ backs for several weeks after hatching. This is a considerable time investment, and the parents must work together to back-brood the chicks and feed them. Great Crested Grebe parent with chicks. Photo by Mike Scott. 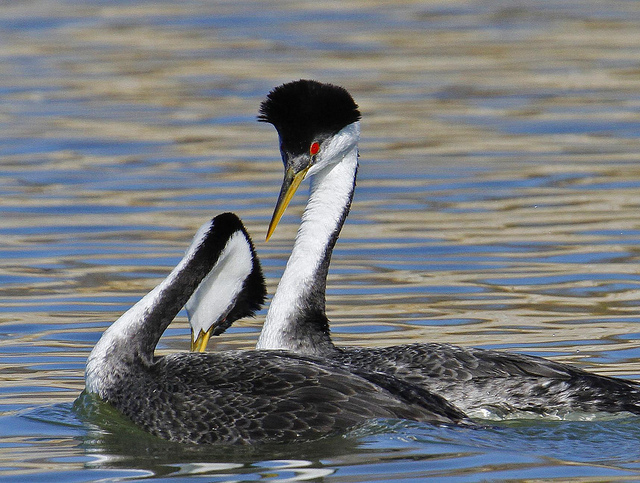 Grebe pairs perform their courtship duets on the water. Here are the high-speed Western Grebes, with David Attenborough narrating and some weirdly meditative music. Here are the head-shaking, rearing Great Crested Grebes (start at 0:45), with some even stranger music. Western Grebes performing an early step in the courtship dance. Photo by Mark L. Watson. Kind of makes you wish that the waltz involved running on water, doesn’t it? Or at least some good beak-dueling. This entry was posted in miscellaneous, video and tagged albatross, animal behavior, biology, birds, courtship, grebe by toughlittlebirds. Bookmark the permalink. 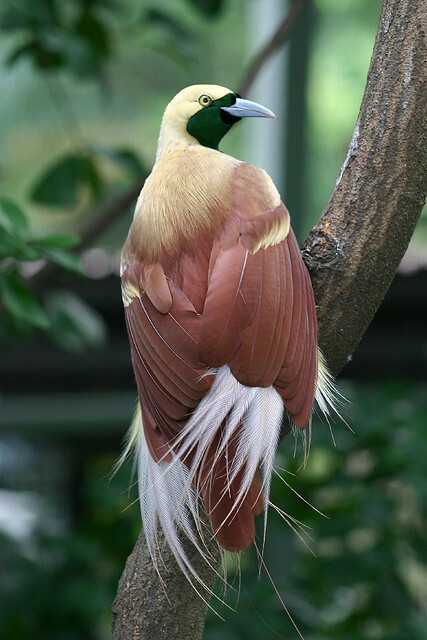 what an amazingly beautiful bird and a great post to boot! Some amazing routines involved. It’s surprising that the little ones make it through to repeat the cycle. Which little ones do you mean? I couldn’t help but think of potential predators with little grebes perched on the mother’s back. Oh, of course! I don’t know why I didn’t get that. They aren’t totally safe riding on mom’s (or, slightly more likely, dad’s) back, but they are probably more so than precocial chicks who walk around (vulnerable to terrestrial predators) or swim (vulnerable to large fish and snapping turtles). And they will float if they get dumped in the water by accident. Another great post. “Reproductive skew” is going to be my phrase of the day – I’ll see how many times I can fit it into a conversation! Haha! Good luck with that – it would definitely be a challenge to fit it into a non-technical conversation. Maybe something like “Did you see the winners of the Westminster dog show? Those purebred dogs sure have high reproductive skew!” I still think you’d get funny looks though. This is what makes bird watching fantastic. I mainly see great crested grebes and black headed gulls courting (not together) and its one thing i look forward too in spring. Oh also the lapwing courting in its looping flight is great too. I’d love to see lapwing courtship. Really wonderful post! And, the videos were definitely worth watching – even with the overdone music. Bird courtship dances and rituals are so fascinating. Through my non-scientist artist-eyes, it feels like Art in its most essential form. Scientifically, it may be a test to see if potential mates are up to the rigors of parenthood, but the beauty of it all is pure art! And, really, that is what human art is, after all…living beings finding ways to explore the complexities of life. What a lovely comment! The courtship displays certainly do have many components of what we would call art in humans – rhythm, coordination, visual spectacularity. I can’t know what’s going on in the birds’ heads, but it certainly wouldn’t surprise me if they experience their dances in a way not too dissimilar to how we experience human art.